Searching for a Portuguese Water Dog? The Portuguese Water Dog or PWD is a lively and athletic working dog that is highly skilled in retrieving live game in water. This dog loves the outdoors and will require vigorous activities such as running, swimming and long walks to be happy. With this said, it is best suited to outdoorsy owners. PWDs are smart, and a bit stubborn, which may prove difficult for first-time dog owners. The lifespan for this breed can reach a maximum of 15 years. Are you looking to buy a Portuguese Water Dog? Before you finalise your decision, find out more about the breed's background. The Portuguese Water Dog was a favourite of fisher folks in Portugal, thanks to its swimming and retrieving skills. The exact ancestry of this breed is not known, but records suggest it was first introduced by Moor Traders who came to Portugal in the 8th century. However, some experts claim that its ancestry can be traced back to the water dogs in 700 BC of the East German Tribe in the wild Central-Asian steppes. When the German Tribe left the steppes, most of these water dogs developed into the Poodle (Germany) and the Portuguese Water Dog (Portugal), which assumes that both these breeds came from the same genetic pool. Other descendants include the Puli (herding dog) and the Kerry Blue Terrier (working dog). In the 11th century, the monks gave the first description of the Portuguese Water Dog in their account of a drowning sailor who was saved by a dog with a "black coat, the hair long and rough, cut to the first rib and with a tail tuft." By 1800s, the popularity of the PWD skyrocketed when it was favoured by King Carlos I who was then a breed enthusiast. In the 1930's, wealthy Portuguese Shipping heir, Vasco Bensaude, started a breeding program that is believed to have contributed to the modern PWDs. Today, the Portuguese Water Dog has been recognised and accepted by The Kennel Club but unfortunately, it has remained unpopular in the UK and as such only a few puppies are registered each year. The Portuguese Water Dog is a sturdy, medium-sized dog with a muscular build. It weighs 35 to 60 pounds and stands 43 to 57 centimetres at the withers. It is slightly longer than it is tall, with the chest broad and the brisket reaching the elbows. Its head is large and wide, with a well-pronounced stop and a muzzle tapering slightly toward the nose. Hanging down next to the head is its heart-shaped ears, while its alert and expressive eyes are round, medium in size and dark in colour. The tail is bushy at the base then tapers to the tip. PWDs wear thick and curly weather-resistant coats but without an undercoat. They come in a variety of colours, which may be black, brown, white, black with white, and brown with white. It sheds minimally, which is great for people with allergies but is high-maintenance when it comes to grooming. Their coats need to be brushed daily to prevent matts and tangles, especially for dogs with longer coats. Part of dog grooming is checking its ears to make sure there is no excessive wax build-up or that the dog is not suffering from an infection. To lessen the chances of infection, always clean the ears regularly. The same is true for dental care. Brush the teeth at least twice a week to avoid gum diseases. Nail trimming is equally important as well since long nails are uncomfortable especially when they get snagged on clothes or the upholstery. Portuguese Water Dogs are skilled water dogs with a sense of humour. They love to spend time with their families and always like to be involved in all family activities. Loyal, friendly and intelligent, these dogs are the excellent companion and family pet. They want nothing more than to please their owners, but also tend to be a little stubborn and wilful. They make great watchdogs but not guard dogs, since they are observant and will bark to alert. However, they will prefer to keep their distance from strangers. When it comes to training, they are eager to please attitude will make them naturally obey commands especially once they know their place in the pack and what is expected of them. But then again, this dog breed is still not suitable for novice owners because they need a firm yet gentle training approach. Portuguese Water Dogs excel in canine sports and can also be great therapy dogs. The Portuguese Water Dogs are excellent with children, but they can be a bit rowdy especially around toddlers. Make sure that the PWD and the kids are always supervised during any interaction, so things don't get out of hand. PWDs are generally friendly and can get along well with other dogs, but there may be exceptions particularly around smaller pets. When socialised early, these dogs can get on well with cats that they've grown up with. A typical serving for an adult Portuguese Water Dog is 2 1/2 to 3 1/2 cups of high-quality dry dog food per day. Providing the best nutrition for your dog is a must. Thus, you should consult a veterinarian. Remember that each dog has unique nutritional needs that can be affected by several factors such as age, size, build, metabolism and activity level. PWDs should be fed with food that has a high protein content to assist in muscle growth and stamina. When you buy commercial dog food, make sure it is formulated for its size and activity level. Also, never free feed your dog, else it will suffer from bloat. The Portuguese Water Dog is a healthy dog breed but is not exempt from being predisposed to certain genetic health disorders such as Hip Dysplasia, Juvenile Dilated Cardiomyopathy, Progressive Retinal Atrophy, and Storage Disease. PWDs are active dogs and as such are suitable for owners who spend a lot of time outdoors. If you buy a Portuguese Water Dog expecting a couch potato, then you did not do your homework. PWDs should be given 30 minutes to 1 hour of daily exercise, either on long walks, playing games of fetch, running, and swimming (which is its favourite). Lack of sufficient exercise may bring out negative behaviours such as chewing, excessive barking and digging. Dogs are man's best friend. Unfortunately, it is not when it comes to your finances. Buying a dog, especially a well-bred one can be expensive. For example, when you buy a Portuguese Water Dog you will have to shell out no less than £1,000. It's a bit costlier compared to other dog breeds since the PWD is hard to come by in the UK, being a rare breed. To get one, you have to be on a waitlist, which could take months or years. Other expenses to consider is the right pet insurance for your dog. There are tons of affordable pet insurance in the market, so choose one carefully. To avail of pet insurance, you will have to pay £30 to £60 a month. Then comes food, which may cost a lot depending on the size of the dog, but a fair estimate is £40 to £50 for high-quality dog food. Veterinary care is another huge cost to factor into your budget, this includes regular visits, vaccinations, boosters, neutering etc., which can quickly add up to £1,200 a year. Overall, you pay somewhere around £80 to £120 when you decide to keep a Portuguese Water Dog. Is a Portuguese Water Dog Right for You? 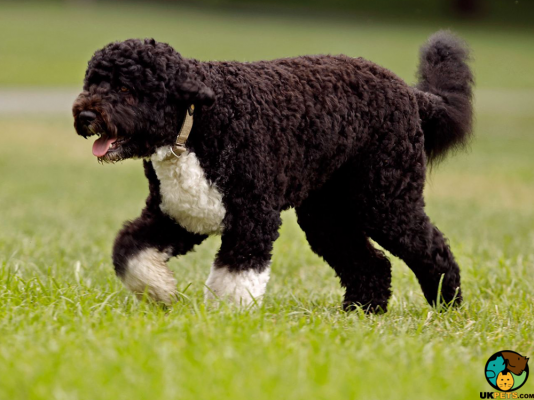 The Portuguese Water Dog or PWD is a lively and athletic working dog. Loyal, friendly and intelligent, it is an excellent companion and family pet. It sheds minimally but is high-maintenance when it comes to grooming. These dogs love the outdoors and will require vigorous activities and exercises. They make great watchdogs since they are observant and will bark to alert.